When Muchisimo (or Mooch for short) first came into my life, the doctors said that he had a congenital problem with the bones in his arms. They did not grow into his elbow sockets correctly and if he did not have surgery soon, his front legs would both become lame. Muchisimo is my #1 guy. So, I rushed out and found the perfect doctor for his surgery. He had a 75% chance of totally improving in one leg and a 50% in the other, but I soon learned that Cotons are troopers. Mooch had his surgery in April and he never complained. Watching him heal was truly an inspiration to us all. It is now July and he is 100% in both legs! We play fetch and run and do all of the things other dogs can do. BUT, when his front legs hurt him, he got used to only using his hind legs. 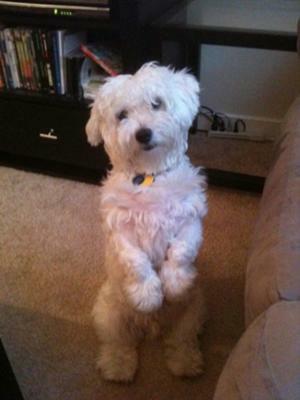 So, sometimes I find him sitting up like a meerkat because he is so good with his back legs. It is too cute for words and a cute souvenir from a harder time. Cotons are the best! I just saw your picture. My Coton, Tank, is eight years old and is very sweet My comment is that my dog and yours are identical in looks. It is freaky. Your story is very touching. Thanks for sharing! Muchi is really a great dog! How good to hear the great news that your Coton is doing well. I am wondering if anyone else has that problem. My dog stands with his feet turned out like a ballerina! Much, much, fun and love with you pup. What a great story! I'm so happy to hear that your #1 guy is doing so well - I love happy endings. Thanks so much for sharing your photos and inspiring story.